A robotics graduate from the UK's Plymouth University has won the national James Dyson award for his prototype 3D printed robotic hand that can be made much faster and cheaper than current prosthetic limbs. Joel Gibbard, the creator of the Open Bionics project, says he can scan an amputee and produce a custom-fitted hand within 40 hours - and at a cost of just over $3000. Current advanced artificial hands can take weeks or months to supply and can cost anything from $30,000 to $95,000 to create and fit. The problem of current robotic prosthetics is their financial barriers. The only alternative to a robotic prosthetic is a cosmetic hand that is functionless and heavy, or an alienating hook. I can 3D print a robotic prosthetic that hand amputees enjoy showing off for a fraction of the price […] We have a device at the lower-end of the pricing scale and the upper end of functionality. At the same time it is very lightweight and it can be customized for each person. The hand is basically a skeleton with a 'skin' on top. So, we can do different things to the skin - we can put patterns on it, we can change the styling and design. There's quite a lot of flexibility there. The biomimetic hand uses myoelectric signals to detect muscle movements via sensors stuck on the owner’s skin. By flexing their muscles, a user can open and close the fingers of the hand and perform a fine pinch grip. Sensors built into the fingers tell the owner when they come into contact with an object to limit the pressure they exert. This means the hand can manipulate fragile objects without the risk of crushing them. Not only has Gibbard gained $3500 for winning the UK leg of the James Dyson award, he now has the chance to compete for the international title and a prize of $45,000. Gibbard says he hopes the win will help bring the project more recognition. He also plans to make the files for the hand open source, allowing anyone to benefit from the technology so long as they share any improvements they make. "This is about driving a big change and democratising technology," he said in his submission for the award. 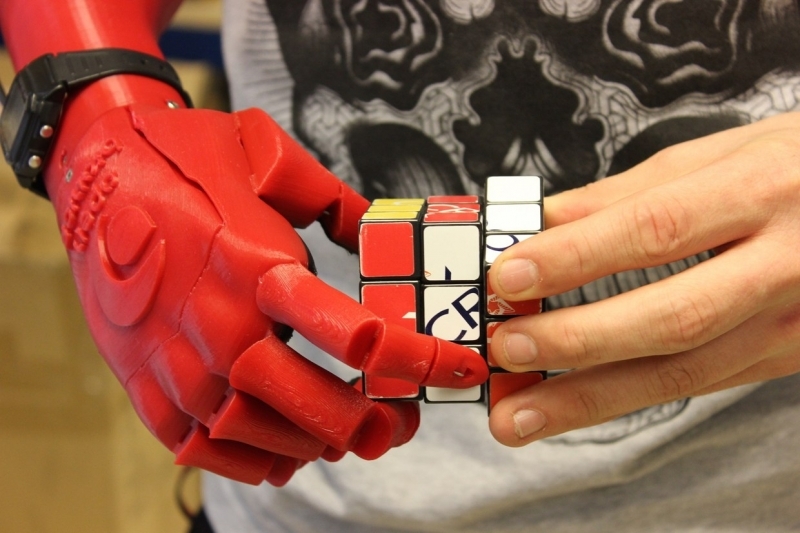 The low-cost robotic hand project started life as an Indiegogo crowdfunding project in 2013. Since then the design has changed ten times and now consists of just four separate parts. Gibbard is currently based in Los Angeles, where his work is being supported by Walt Disney's Techstars Accelerator mentorship and investment program. For more on Open Bionics' 3D printed hand project, check out the video below.